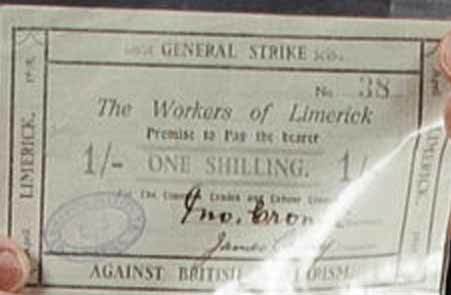 Survey of Limerick Soviet Notes • How many are out there? 1919. 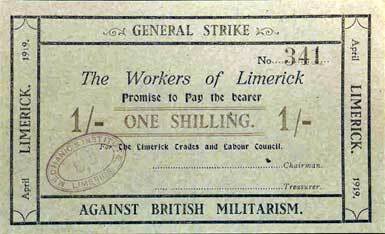 The short-lived General Strike in Limerick which produced an interesting banknote issue. 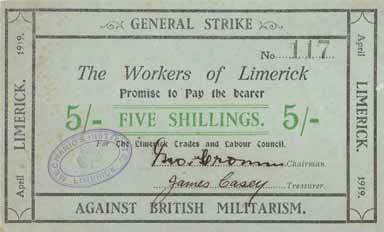 The 'Limerick Soviet' is a term given to a general strike in Limerick city from 15 to 27 April 1919, organised by the Limerick Trades and Labour Council, as a protest against the British army's declaration of a "Special Military Area" under the Defence of the Realm Act, which covered most of Limerick city and a part of the county. The soviet ran the city for the period, printed its own money and newspaper and organised the supply of food. An article on the event is available here. A book on the Limerick Soviet is available as a pdf download, "Forgotten Revolution - The Limerick Soviet 1919" by Liam Cahill, Special on-line edition 2003. 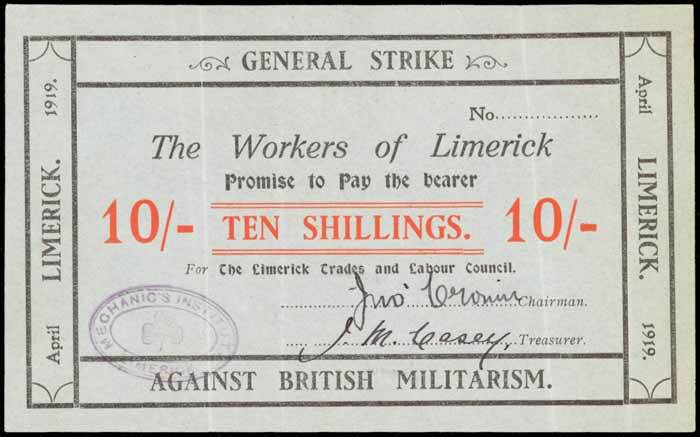 Limerick Soviet Notes are among the rarest of Irish Notes. I believe the banknotes were first noted in numismatic circles around 1969. Members are invited to post in this thread pictures of notes they have seen or recorded. 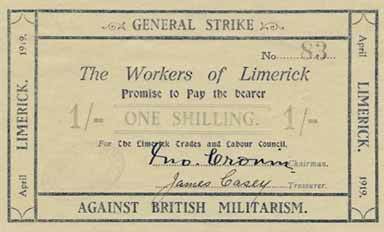 Re: Survey of Limerick Soviet Notes • How many are out there? Here is a 10 shilling note with a different signature variation. Here's a Limerick Soviet note with no signatures. I've been doing a lot of work on these lately. There should be some interesting results soon. New content added to the Limerick Soviet section on the main website. I'll be adding lots more pictures also, during the site upgrade process. The Limerick Soviet Note Census (LSNC) is progressing nicely, with a good range of the notes now recorded. The census will be the subject of an article in Coin News within the next few months. 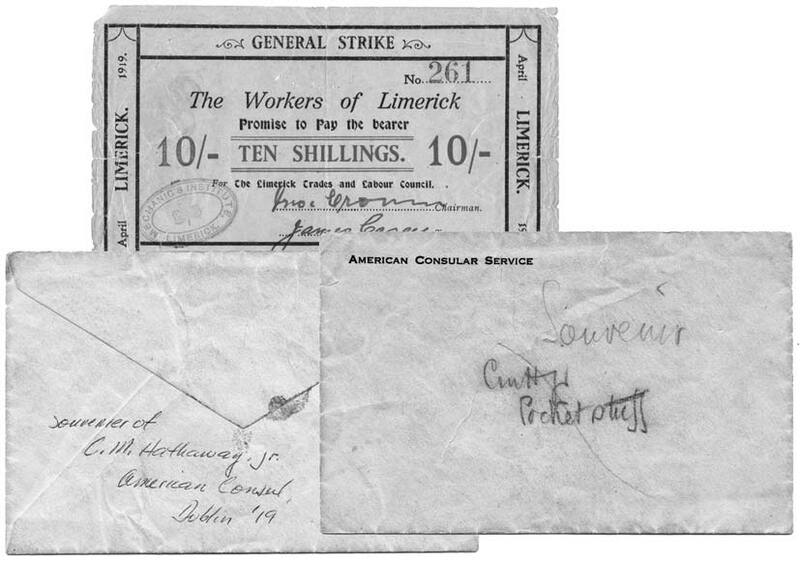 Here is a variation of the Limerick Soviet notes—some of the later notes were printed on grey-bluish paper rather than the off-white of most notes. Three more Limerick Soviet notes have been recorded recently, two 10s notes and one 5s note, all in the National Museum of Ireland. So what’s the count on these in the survey now? 38 notes have been recorded so far. Have any shown up outside Ireland ? Hoping I stumble across one States side, but no luck yet !! 10 Shillings Number 261 (pictured at the top post), and the note above which doesn't have a number both turned up in the US. Another 1 Shilling note added to the census, number 38. It looks to be in nice condition. Thanks to Doc for spotting this one. The relative proportion of newly recorded notes in museums is increasing as more notes turn up. 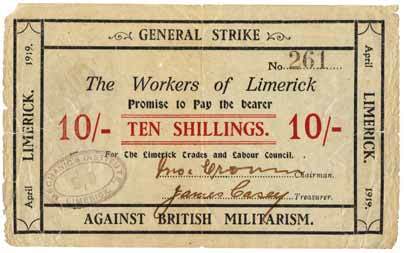 It will be interesting to see what 2019, the centenary year of the Limerick Soviet, will turn up in terms of newly recorded notes. At the last count, 15 of the recorded notes are known to be in museums.